An expressive, matrix-controlled arpeggiator designed to play with your thumbs. 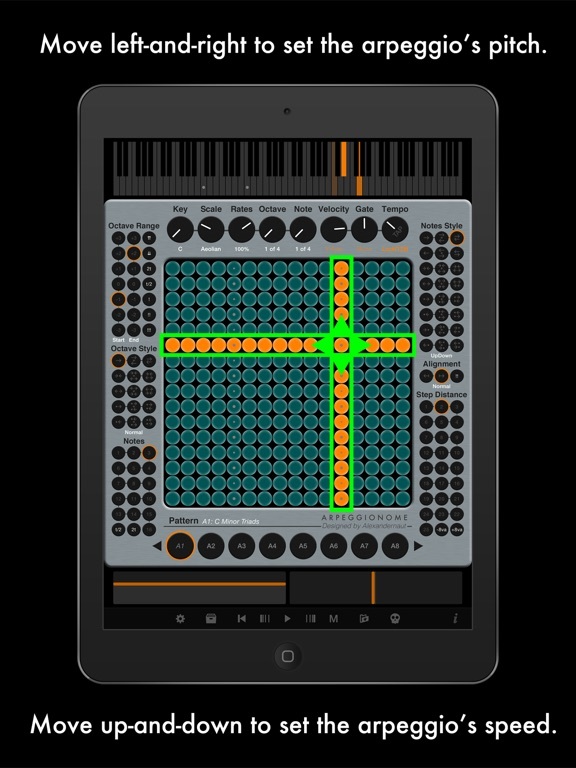 Control super fast arpeggios with precision, and apply pitchbend, tremolo, and vibrato with the iPad’s accelerometer. Ableton Link is a new technology that synchronizes beat, phase and tempo of Ableton Live and Link-enabled iOS apps over a wireless network. It's awesome. Go to Settings>Ableton Link Settings for more info. 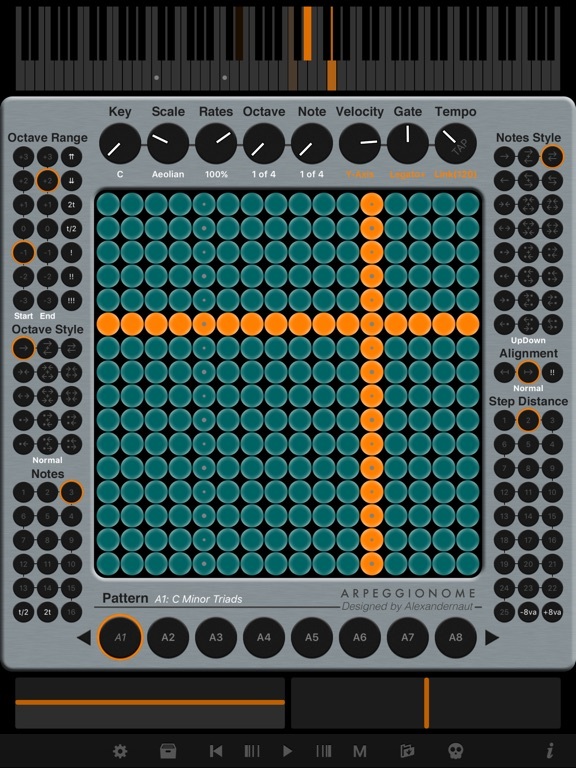 Arpeggionome Pro has a new setting called 'Matrix Mode', which adds dotted note values to the Performance Matrix. 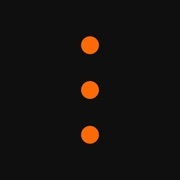 To try it out, go to Settings >Interaction Settings and set Matrix Mode to 'Halves+Dotted+Triplets'. You'll notice the matrix now has two columns of squares, triangles, and dots. ■ Rows with squares play rates that are perfect halves of a measure — starting at 1/2 at the bottom row. 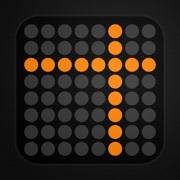 ● Rows with dots play rates that are the dotted values — i.e 1.5x the length of the square row above. 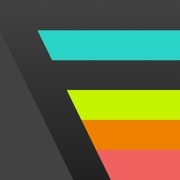 ▲ Rows with triangles play rates that are triplet values — i.e. 0.33x the length of 2 square rows below. In Settings>Interaction Settings, you'll also find a new button at the bottom of the list called "ALT Interaction Settings". This is an alternative interaction state that I recommend trying. It's a bit more difficult to control, but I find the results quite interesting. Compared to the "Default Interaction Settings", it uses the new Matrix Mode setting and disables Retrigger for all parameters. Hey, it's been a while! The last time I looked at the Arpeggionome Pro code base was over 2.5 years ago! Time is weird. In any case, I'm really glad to finally get this long overdue update of Arpeggionome Pro out. And I'm especially excited about adding Link and the new Matrix Mode setting. 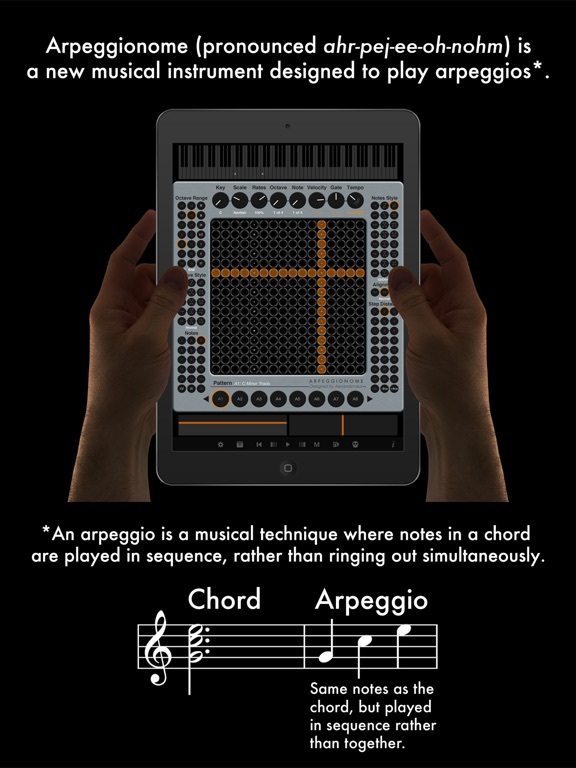 As you may know, Arpeggionome Pro is designed to play super fast arpeggios. Further, it's designed to be held in your hands in portrait mode, so you can quickly perform changes with your thumbs. Also, under the hood, all changes you make are quantized — allowing you to anticipate time by touching a parameter early, so the change happens at exactly the right time. This is great, and works very well… However! It's always been a challenge to start the sequencer from not playing to playing. You could press the play button and just let it run, but if you wanted to control starting and stopping in a more expressive way (which I very much prefer! ), it gets a bit more complicated. That first touch would always happen the moment you touched, but every other touch would be quantized. Subtle difference for sure, but definitely weird.